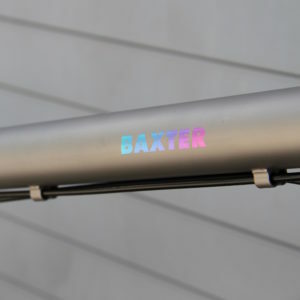 During Eurobike we will be showing the above BAXTER to the cycling industry. It’s built out with SRAM Force 1 and a few tricks here and there. The Baxter was affectionatly named after a long time shop dog named BAXTER. A true friend in a Chocolate Lab that was easily anyone’s friend….especially if you had treats. Well, BAXTER passed away and when this model of bike came to be it was a natural fit to name it after the loppy dog that hung out in our CNC area. 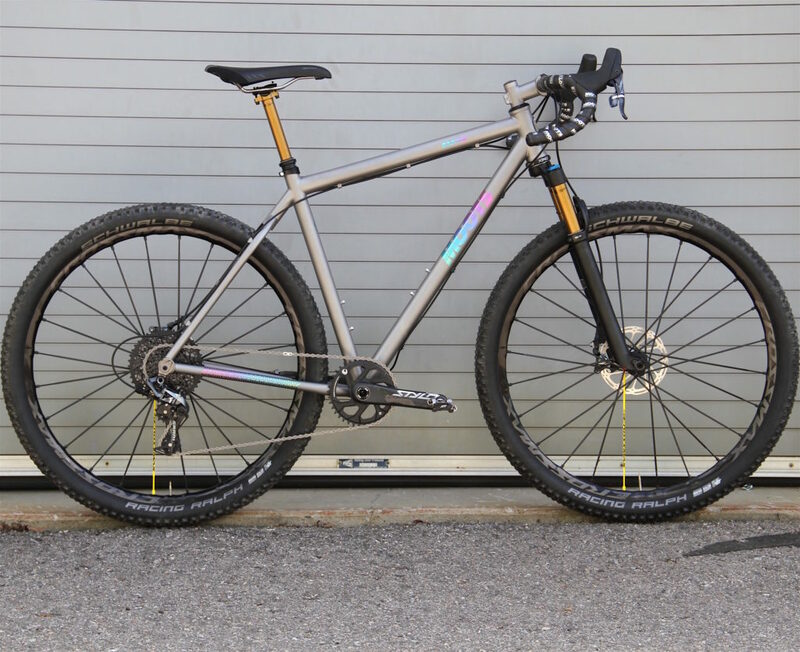 Key characteristics of the BAXTER are its ability to perform well over varied terrain and lean a little more towards a drop bar mountain bike than an all out gravel bike. 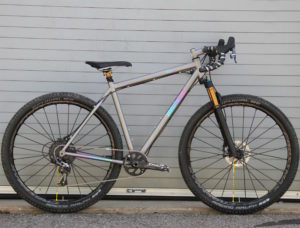 29 inch wheels wrapped in 2.25’s can handle big gravel, deep sand and technial single track. The Baxter can be built with a rigid fork or suspension fork depending on your riding needs and terrain. 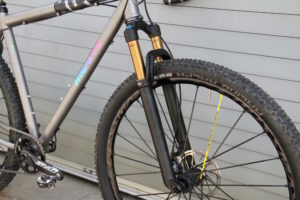 The Enve rigid fork works nicely for a super responsive feel, while a 100mm Fox Fork plays nicely with the geometry if suspension is best for you. A 44mm head tube leads the way up front to keep handling precise and crisp. An open front triangle lends itself to bike packing bags or two water bottles. A third water bottle under the downtube is stock and can hold another bottle or tool keg. 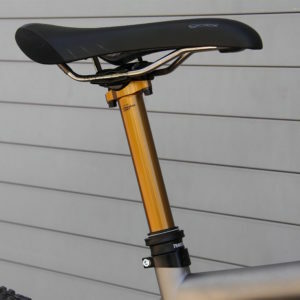 We use an English treaded bottom bracket for durability and serviceability. The rear of the Baxter is 142 x 12 spacing, with a post mount disc mount ready for a 160mm rotor for stopping duties. 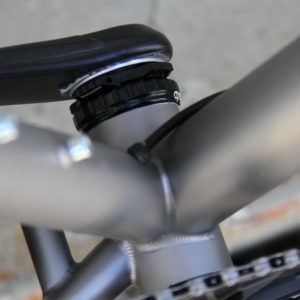 Stealth dropper routing shown here as it enters the lower part of the seat tube. Fox Transfer Dropper with Stealth routing. The pattern from the carpet used in the movie The Shining. 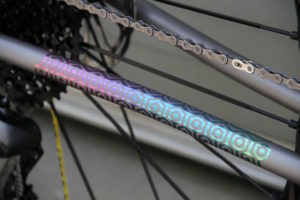 Brillant anodized fade. For this BAXTER build we went with a suspension fork and used the FOX 100mm 32 fork. In modern day terms the 100mm is short travel compared to long travel bikes, but fits right in on the BAXTER. Fox also handles duties for the dropper with the Transfer post. 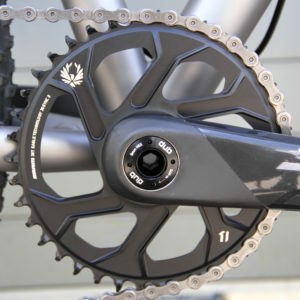 The SRAM Force 1x set up gives us a simple drive train and great stopping power. 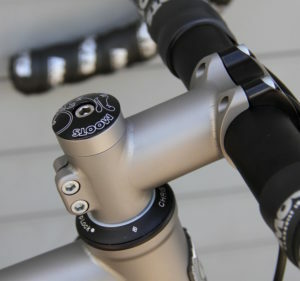 The left Force lever has been modified to accuate the dropper post, so all controls are at your finger tips. 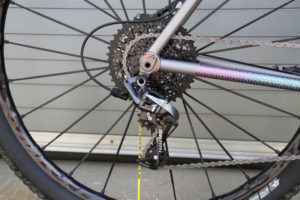 A direct mount, wide-narrow 38T chainring up front with a 11-46 11 speed cassette and Force 1 derailleur handle the drive train. A dependable Mavic Crossmax 29 wheel set and Schwalbe Racing Ralph’s keep things stiff and light.  The rider of the BAXTER loves adventure and could possibly get in over their head while discovering new routes. Riding a BAXTER also means that those trails you know by heart and have become boring on your overbuilt mountain bike, get that new feeling and just a bit more pucker factor than you’re use to. Bike packing, commuting, gravel rambling and route finding. BAXTER could be your new best friend.